How to make a devinely rich and dark chocolate cake. How to make a banana cake and decortate with cream and frosting. 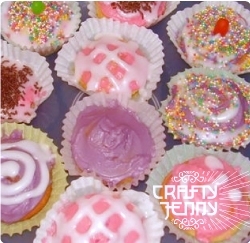 How to make cupcakes: tasty, colorful treats for those special occasions! Delicious! And can be made in the time it takes to heat your oven. This is a traditional Spanish tapa. The English translation would be Spanish Ham Croquettes. Here is the quickest traditional Spanish tapa you could ever make: simply bread with tomato and olive oil. This is a traditional Spanish tapa. The English translation is 'Mushrooms in garlic'. We are now providing 'Crafty Jenny Recipes' in video format. Learning to cook new recipes couldnt be made easier, and like everything on Crafty Jenny - they are all free! A to make healthy branberry muffins. How to make a deliciously rich chocolate slice. A family favorite. How to make marshmallow slice. It's yummy gooey and artistic! A fabulous quick and tasty meal.